Understanding the Facebook algorithm starts with knowing the core values that Facebook uses to guide their thinking and work. 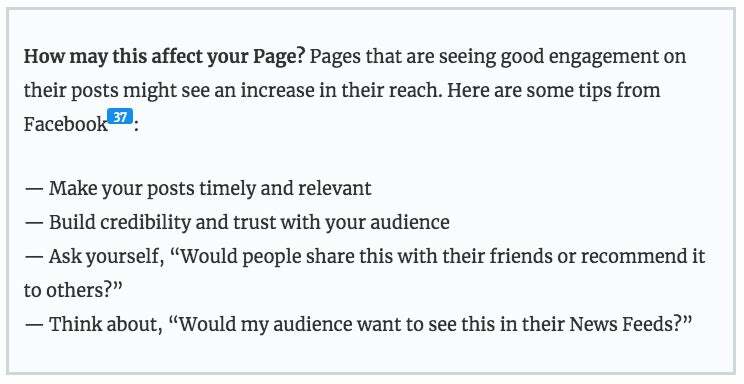 These values can give you a hint of what content will do well or not so well on Facebook. Friends and family come first: The main objective of the News Feed is to connect people with their friends and family. So posts from friends and family are prioritized. After those posts, Facebook found that people want their feed to inform and entertain them. Authentic communications: Facebook prioritizes genuine stories over misleading, sensational and spammy ones. You control your experience: Individuals know themselves best. So Facebook creates features (such as "unfollow" and "see first") to let people customize their Facebook experience. Constant iteration: Facebook strives to constantly collect feedback and improve the platform. So how does Facebook decide what to show in a News Feed? To make it easy for you to understand the Facebook algorithm, we went through all the (known) changes that Facebook has implemented to its algorithm and came up with a list of factors that we think may determine whether your post shows up or not. 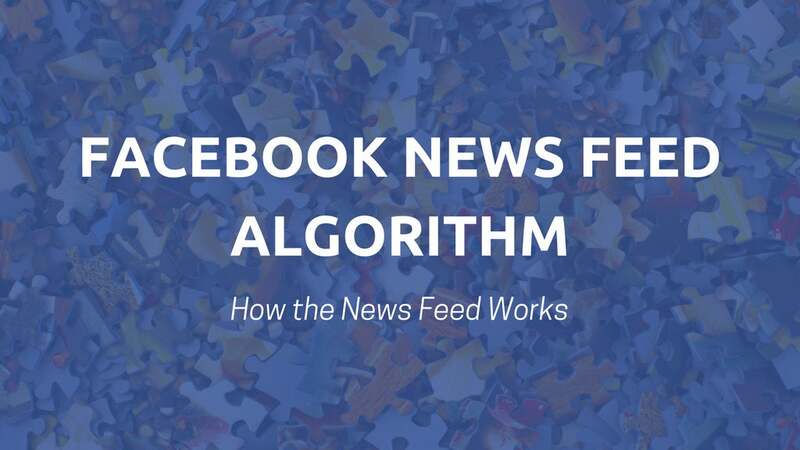 If you want to dig into the Facebook News Feed algorithm, read on to find out all the relevant changes Facebook has made. Facebook will be blocking Pages that share false news from buying ads on Facebook. Facebook found that some Pages had been using Facebook ads to build their following and share false news more widely. To prevent the spread of false news on Facebook, Pages that repeatedly share false news will no longer be allowed to buy Facebook ads (until they stop sharing such news). The false news will be identified by third-party fact-checkers. Facebook will be demoting Facebook posts that pretend to be a video. Spammers have been tricking people to click on Facebook posts that look like a video but aren’t. These deceptive posts are often videos with just a static image, or they feature a false video play button when it’s actually a link. Facebook will be showing fewer stories with links that might take a long time to load. 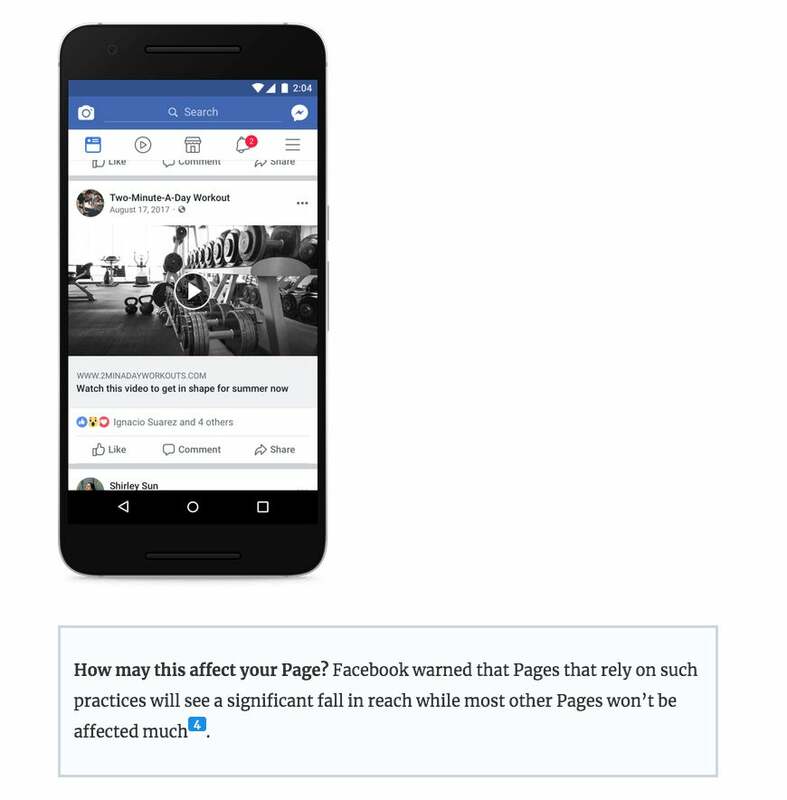 Hence, Facebook is rolling out an update to show more posts with links that load quickly and fewer posts with links that might load slowly, in the News Feed. 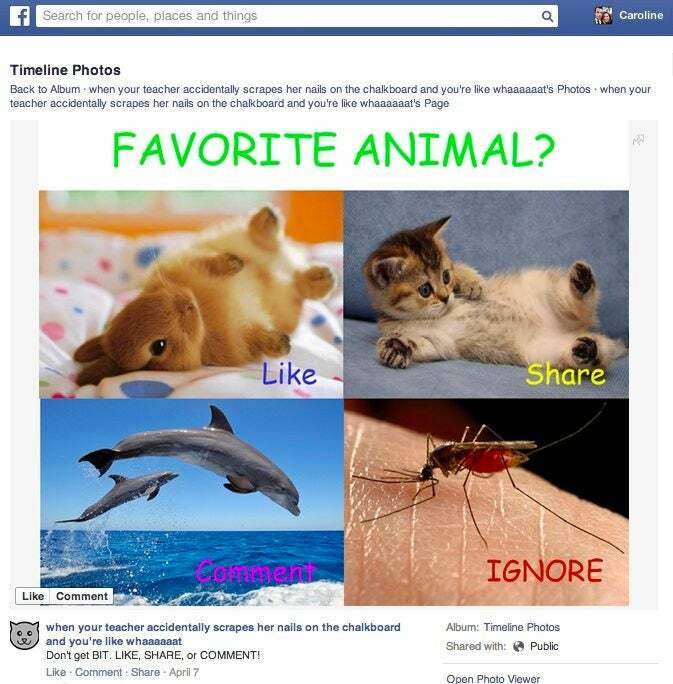 Facebook is rolling out an update to show fewer posts with clickbait headlines. Posts that link to articles with such headlines will rank lower in the News Feed. Facebook is rolling out an update to show fewer posts and ads that link to websites with low-quality experience. Posts that link to such websites will rank lower in the News Feed and might not be allowed to be used as Facebook ads. Facebook is making two changes to help authentic and timely stories rank better. To surface authentic content, Facebook will be analyzing Facebook Pages to see if they have been posting spam or trying to game the News Feed by asking for Likes, comments, or shares. If Facebook finds that a Page’s posts might not be authentic, such as people are often hiding those posts, Facebook will rank those posts lower in the News Feed. To show people stories at the right time, Facebook will now study how people interact with posts in real time. For example, if there’s an important soccer game going on and many people are talking about it on Facebook, Facebook will show relevant posts higher in the News Feed. Facebook is going to show long videos that people spend time watching to even more people. When ranking videos in the News Feed, a factor that Facebook considers is “percent completion” -- the percentage of the video you watched. Facebook now recognize that it takes more commitment to complete a long video than a short one. So it will now put more weight on the “percent completion” factor for longer videos. As an example, if people are, on average, watching 50 percent of a 30-second video and 50 percent of a 10-minute video, the 10-minute video will rank better in the News Feed than the 30-second video. That’s because the 10-minute video has to be more engaging than the 30-second video to keep people watching for five minutes (vs. 15 seconds). Facebook will be showing you more stories that are personally informative to you. 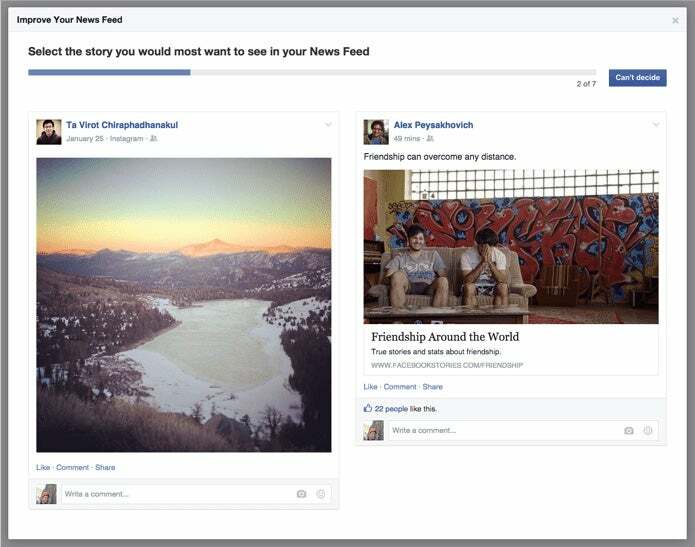 From its Feed Quality Program, Facebook found that people enjoy stories that are informative to them. Using the patterns that they learned from the program, Facebook will try to identify stories that are informative -- usually, if they are related to people’s interests, if they engage people in broader discussions, and if they contain news relevant to them. Facebook will then combine this new signal with signals of how relevant the story might be to each individual, to predict if they might like it. Facebook will be showing stories from close friends higher up in the News Feed. Despite the previous update, people are still worried about missing important updates from their close friends. So Facebook is tweaking the News Feed algorithm again to rank posts from close friends higher up in the News Feed. Facebook will be ranking articles that it thinks you will spend time reading, higher in the News Feed. Facebook learned that the amount of time someone spent reading or watching the content of an article indicates how interesting the article was to them. So Facebook is adding a new ranking factor -- how long someone might spend looking at the article. To keep things fair between short and long articles, Facebook will be looking at the time spent within a threshold. A smaller change within this update is that Facebook will be showing fewer posts from the same Page together in the News Feed. That’s because people find that repetitive and prefers content from a diverse range of Pages. Facebook is more likely to rank Facebook Live videos higher in the News Feed when those videos are live than when they are no longer live. Facebook found that, “People spend more than 3x more time watching a Facebook Live video on average compared to a video that’s no longer live.” That’s because those videos are more interesting when the event being filmed is happening live than after the event. 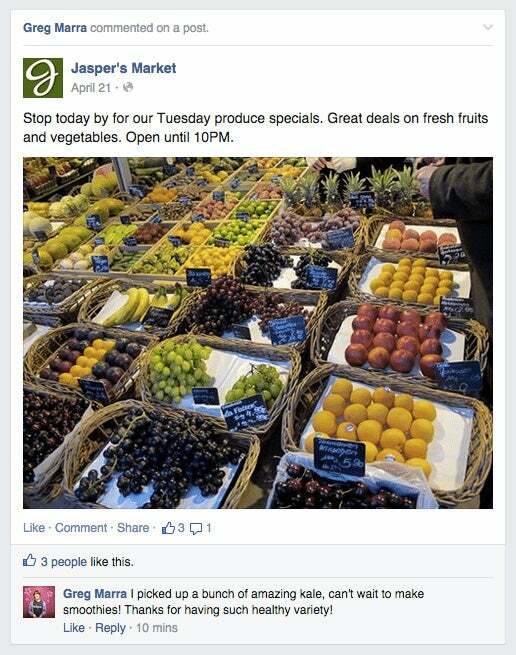 Facebook recently rolled out Reactions -- their supercharged "Like" button -- to help businesses better understand how people are responding to their content. For a start, when someone uses a Reaction, Facebook will infer they want to see more of that type of post, just like when they Like a post. But this could change. Facebook surveys thousands of people every day to improve the News Feed ranking. Besides looking at quantitative signals such as Likes, comments, and shares, Facebook also surveys thousands of people every day to understand whether the News Feed algorithm is showing people the posts they want to see. If a popular post isn’t something that the people surveyed want to see, Facebook will rank that post lower in the future. Facebook is making it easier for people to adjust and customize their News Feed settings. The preferences tab will be more visible and more intuitive, allowing people to find Pages and people to like and follow and easily selecting to follow/unfollow certain content. Facebook now considers more actions on videos while ranking videos in the News Feed. Facebook found that many people don’t feel inclined to Like, comment on or share a video even when they enjoyed the video. So besides considering whether someone watched the video and for how long, Facebook is now taking into account of more actions such as choosing to turn on the sound, watching the video in full screen and enabling high definition. These actions indicate that they enjoyed the video. How much time you spend viewing stories becomes a factor that Facebook uses to determine what to show at the top of your News Feed. While many people might not Like, comment on, or share a post that they found meaningful, they would likely spend more time on it than other posts. Hence, Facebook is taking this as a signal for ranking Facebook posts. By understanding what types of content someone prefers, Facebook can surface similar types of content higher up in their News Feed. Facebook is rolling out three updates to improve the experience of the News Feed. The first is for people who do not have much content to see -- maybe because they don’t follow many people or Pages. Facebook used to have a rule that prevents people from seeing multiples stories from the same source in succession. They are now relaxing the rule so that if you reach the end of your News Feed but still want to see more stories, you’ll see more. The second is to show posts from friends you care about, higher in your News Feed so that you are less likely to miss them. 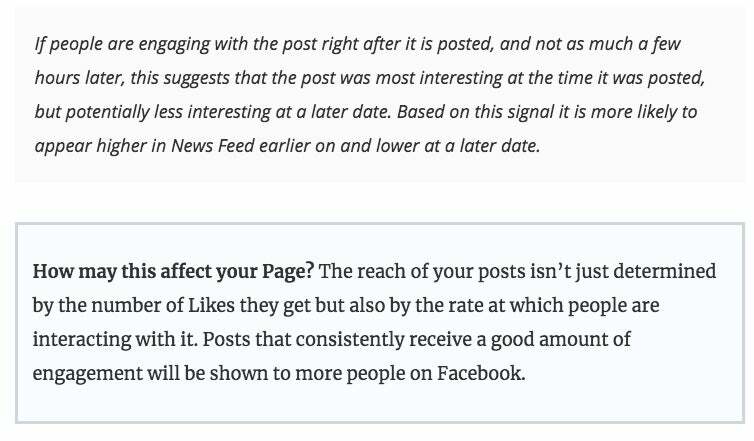 If you read and interact with posts from Pages, you’ll still see them on your News Feed. Facebook to update the way Page Likes are counted, removing the Likes of memorialized accounts and deactivated accounts. 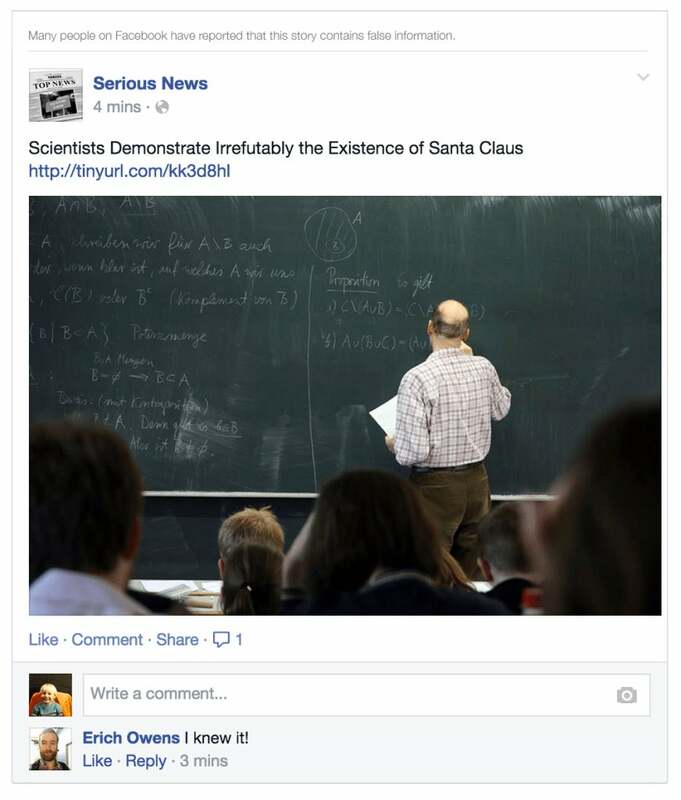 Facebook aims to reduce the number of hoaxes in News Feed with algorithm tweak. To reduce the number of posts containing misleading or false news, Facebook has announced that the News Feed algorithm will begin to factor in when many people flag a post as false or choose to delete posts. 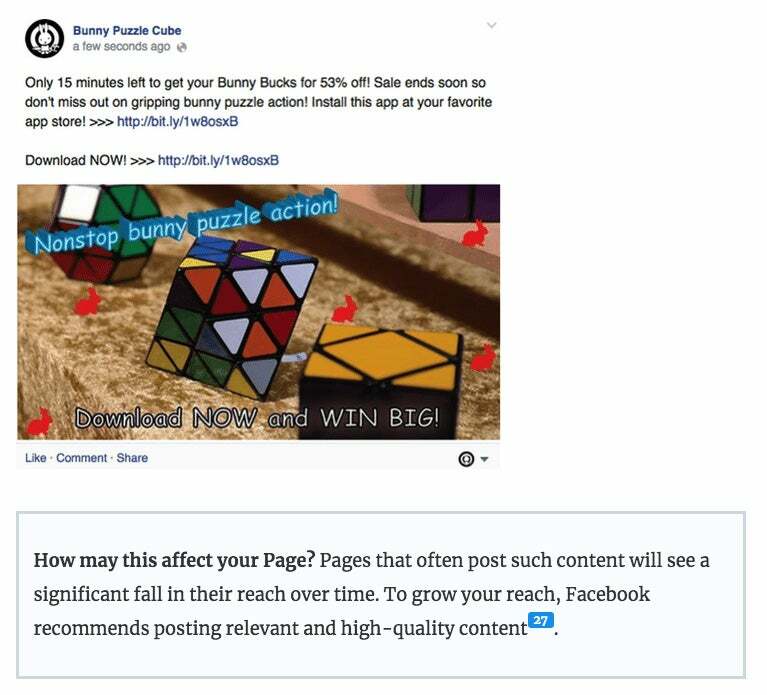 Facebook will reduce the reach of such posts and add a warning on the post (without reviewing or removing the post). In just one year, the number of video posts per person has increased 75 percent globally and 94 percent in the US. The amount of video from people and brands in the News Feed has increased 3.6x year-over-year. Since June 2014, Facebook has averaged more than 1 billion video views every day. On average, more than 50 percent of people who come to Facebook every day in the U.S. watch at least one video daily. Seventy-six percent of people in the US who use Facebook say they tend to discover the videos they watch on Facebook. Facebook is rolling out an update to reduce the number of overly promotional posts in the News Feed. Facebook heard from people that they want less promotional content on their News Feed and more stories from friends and Pages they Like. Facebook will be looking at when people are Liking, commenting, and sharing. Facebook used to only look at the total number of Likes on a post when ranking it in the News Feed. Now, Facebook will also look at the rate at which people are Liking, commenting on and sharing a post. Facebook stops showing ads that are offensive or inappropriate. When people hide ads in their News Feed, Facebook takes it as a signal that others might not want to see them, too, and show them to fewer people. Now, Facebook is also asking people why they hid the ads. If it’s because the ad is offensive or inappropriate, Facebook will stop showing the ad. Facebook will be looking at bounce rate to determine if an article is using a clickbait headline. If someone clicks on an article and returns to Facebook immediately (or “bounce”), it might mean that they didn’t find what they were expecting. This is often because the article is using a clickbait headline. Facebook will be using this signal when ranking the article in the News Feed. In addition, Facebook will also be monitoring if people are Liking, commenting on, or sharing the article after they click on it. If few people are, it’s likely that the article is not valuable, relevant, or meaningful. Facebook will then rank it lower in the News Feed. 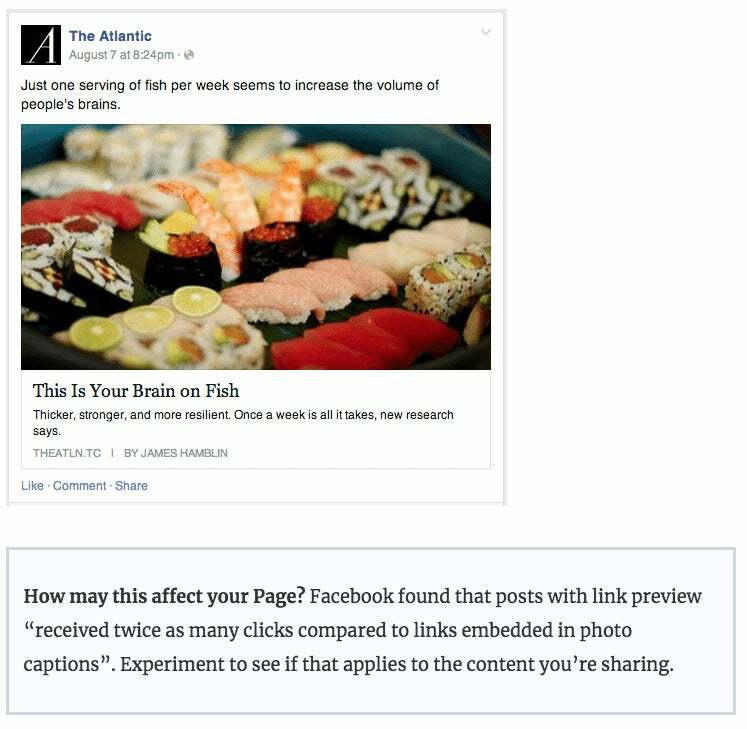 Facebook will also be ranking posts with a link preview higher in the News Feed than posts with a link just in the caption -- as the link preview shows more information about the article. Facebook will now be able to understand (and rank) videos uploaded directly to Facebook better. For videos that are uploaded to Facebook directly, Facebook is now able to know whether someone has watched it and for how long. It seems that they are unable to do that for links to YouTube (or other video sites) videos. Having this new information will allow Facebook to rank Facebook videos better. Early tests have shown that people are watching more videos that are relevant to them. 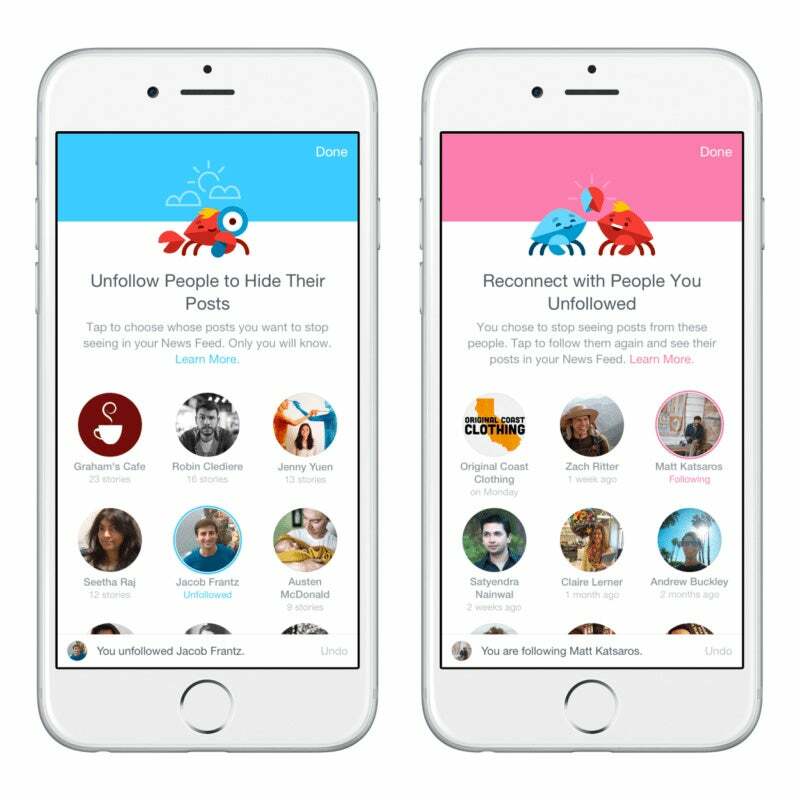 Facebook will show fewer posts that explicitly ask for Likes, comments, or shares. As people have reported that such posts are less relevant than posts with a similar amount of engagement, Facebook will be ranking these posts lower in the News Feed. Facebook has developed a new algorithm to find and show high-quality content to users. The algorithm also uses thousand other factors to determine if a post is a high-quality content. Some of these factors include “how frequently content from a certain Page that is reported as low quality (e.g. hiding a Page post), how complete the Page profile is, and whether the fan base for a particular Page overlaps with the fan base for other known high quality Pages.